. Edo Bakufu articles . 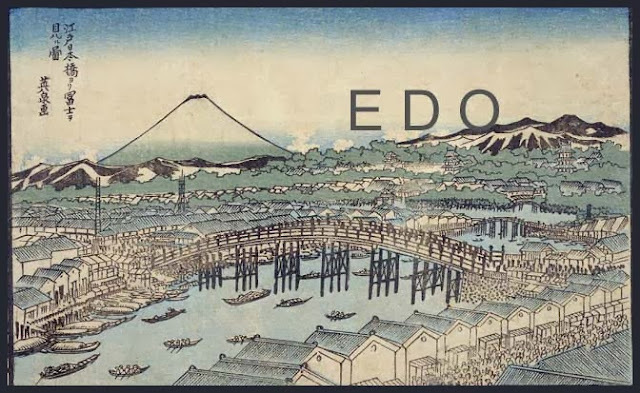 the Edo bakufu (江戸幕府), was the last feudal Japanese military government which existed between 1603 and 1867. The heads of government were the shoguns, and each was a member of the Tokugawa clan. 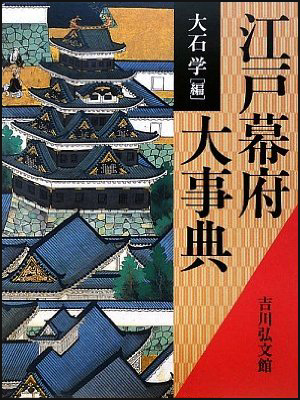 The Tokugawa shogunate ruled from Edo Castle and the years of the shogunate became known as the Edo period. This time is also called the Tokugawa period or pre-modern (Kinsei (近世)). The bakuhan taisei (幕藩体制) was the feudal political system in the Edo period of Japan. Baku, or "tent," is an abbreviation of bakufu, meaning "military government" — that is, the shogunate. The han were the domains headed by daimyo. He stayed at the domain and looked after the regional affairs on behalf of the Daimyo.
. bakufu goyootashi 幕府御用達 craftsmen working for the Bakufu government .
. Bakumatsu 幕末 写真　photo collection .
. Bakumatsu aera 幕末の人　people visiting Japan (1853 - 1867) .
. kawaraban　瓦版 Edo newspaper, handbill, broadside .
. bakuryoo　幕領　Bakuryo government land, bakufu-owned land, .
. mizubugyoo, mizu bugyō　水奉行 Waterworks administrator . A Shogun (将軍 Shōgun) "general", lit. "military commander"
was a hereditary military dictator in Japan during the period from 1192 to 1867, with some caveats. In this period, the shoguns were the de facto rulers of the country, although nominally they were appointed by the Emperor as a formality. The Shogun held almost absolute power over territories through military means, in contrast to the concept of a colonial governor in Western culture who was appointed by a king. Sei-i Taishōgun (征夷大将軍, "Commander-in-Chief of the Expeditionary Force Against the Barbarians"
..... in reality shōguns dictated orders to everyone including the reigning Emperor. His son, Tokugawa Iehiro , is a University of Michigan-educated translator. Other branches were formed in the decades after Ieyasu, which bore the Matsudaira surname. Some of those branches were also of daimyo status. roughly comparable to the office of prime minister. The system for maintaining law and order during the Edo period differed fundamentally from our modern system in that law enforcement and criminal justice were carried out by the same organs. That is to say, one agency or office carried out the functions that are today performed separately by police, prosecutors, and the courts. This means that the administrative and judicial functions of government were merged rather than deliberately separated as they are in modern democratic states. Although the Tokugawa shogunate held sway over the daimyô (lords) of all the country’s domains, the administration of each of these domains was left to the individual daimyô; in principle, the shogunate administered only its own domains. However, since the administrative apparatus of each domain, including law enforcement and criminal justice, closely resembled the system established by the shogunate, an examination of the latter system should be sufficient to provide an overview of law enforcement in the Edo period. The top administrative post under the shôgun was that of rôjû, or senior councillors. (At times a tairô, or chief councillor, was appointed as a superior to the rôjû, but this was not a permanent post.) Typically, the shogunate appointed four or five rôjû from among the fudai daimyô, lords of the domains that Ieyasu, the first Tokugawa shôgun, had originally granted to his loyal vassals in the early seventeenth century. The rôjû generally took turns managing the shogunate’s administrative affairs according to a monthly rotation system, although they came together to confer on matters of importance. Ranking just below the rôjû were the wakadoshiyori, or junior councillors. They were also chosen from among the fudai daimyô and likewise served according to a monthly rotation. Since the rôjû and wakadoshiyori together made up the top administrative organ of the Tokugawa government, they were inevitably involved in matters pertaining to law enforcement and criminal justice, whether directly or indirectly. Next in importance in the central administrative apparatus were the metsuke (inspectors) and ômetsuke (inspectors general), whose main job was to monitor and control the activities of the ruling warrior class. The ômetsuke, reporting directly to the rôjû, monitored the daimyô, while the metsuke, who were under the supervision of the wakadoshiyori, focused on the shôgun’s direct retainers—the hatamoto, or bannermen, and the gokenin, or housemen. Both were selected from among the hatamoto. With its reliance on peer monitoring, the metsuke system might be compared to the military police of a modern army or the internal affairs bureau of a police department. The highest offices with direct police and judicial authority were the three bugyô, or commissioners, who reported to the rôjû. While many of the positions within the vast shogunal bureaucracy had originated as military posts in the era of civil unrest prior to the Edo period, the posts of the three bugyô were created after the shogunate was established in Edo, and they had a distinctly civilian flavor. The first and highest-ranking of the three was the jisha bugyô (commissioner of temples and shrines), who had authority over the lands of all the temples and shrines in the country, the priests and monks attached to those institutions, and the people living within their precincts. In addition to wielding general administrative authority over these lands and people, the jisha bugyô also adjudicated civil suits, investigated crimes, and tried suspected criminals associated with the temples and shrines. The central job of the kanjô bugyô (commissioner of accounts) was fiscal management, but the holder of this post also wielded police authority with regard to serious crimes carried out within most of the shogunate’s direct holdings. This is because the authority of the gundai or daikan who directly governed those areas (the name depended on the size of the holding) extended only to the collection of taxes from local farmers and the prosecution and adjudication of civil cases and certain minor criminal cases; in all other criminal cases, the accused, together with the record of the preliminary investigation, was sent to the higher court in Edo, namely the kanjô bugyô. 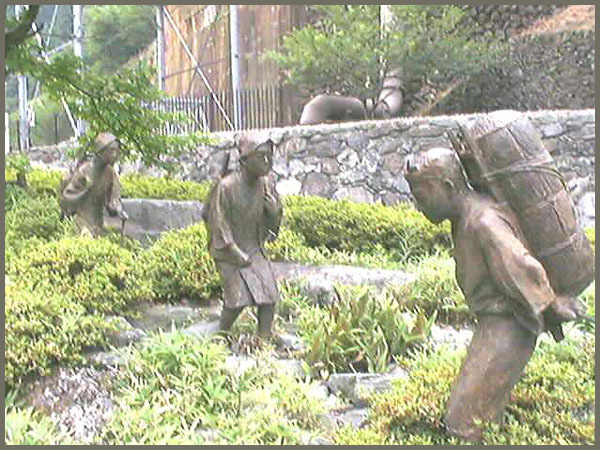 Since the kanjô bugyô thus combined the authority of a finance minister and a chief justice, only the most capable people could fill the post, and they were kept very busy. Four people ordinarily filled it on a monthly rotating basis.
. nengoo, nengō 年号 Nengo, "year name", era name .
. Edo goyaku　五役（ごやく）　the five official workers of Edo . Rusui yaku were samurai officials in the service of Edo period domains, who oversaw the administration of the domain's mansions in Edo or other cities in the lord's absence. They served an extremely important role as the domain's representative in the city, as administrators and intermediaries, facilitating the domain's involvement in political and economic matters in the major metropolises. 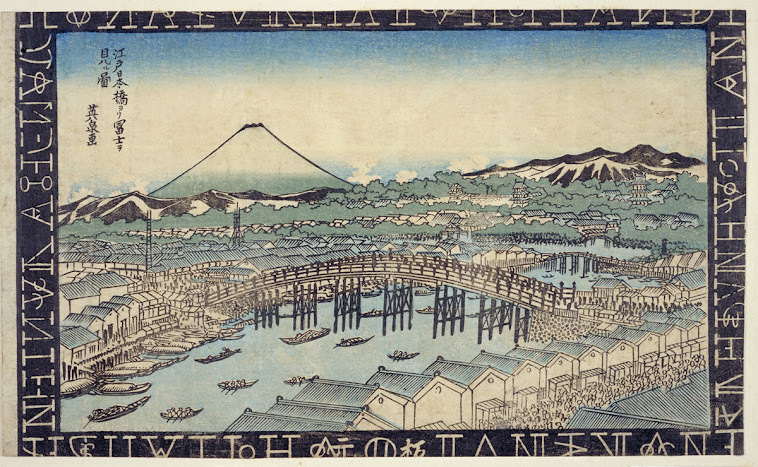 were diverse and extensive, including maintaining the domain's mansion and preparing it for the arrival and residence of the lord or other members of his household; communicating on behalf of the domain with the shogunate and other official institutions, including at times filing formal inquiries or complaints with the shogunate; and communicating with the rusuiyaku of other domains, as intermediaries in arranging various political, personal, or economic matters between domains; among many other activities.
. Bakufu Meeting with PowerPoint .
. ninsoku yoseba 人足寄場 rehabilitation prison .
. doozan 銅山 Dozan copper mines in Japan .
. samurai, warriour, tsuwamono, bushi　侍, 兵、武士、兵士 .